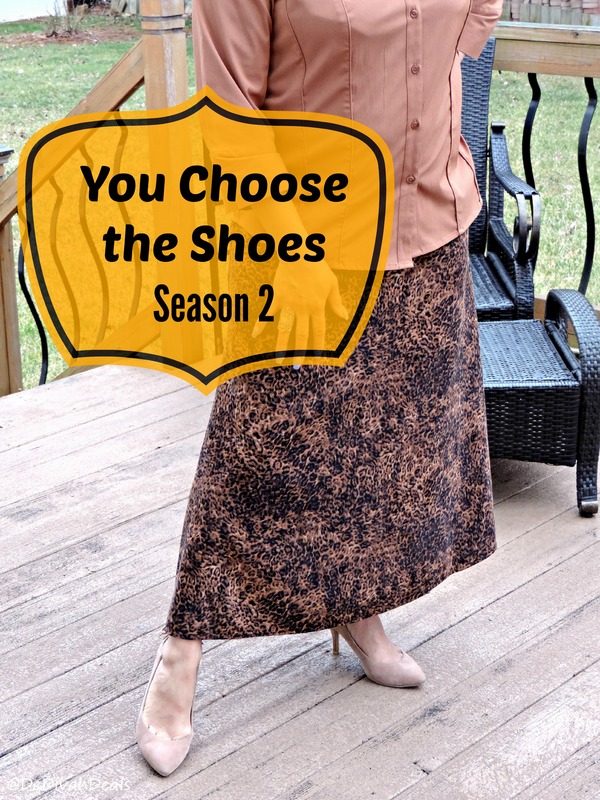 Hello friends and welcome to You Choose the Shoes ~ Season 2. 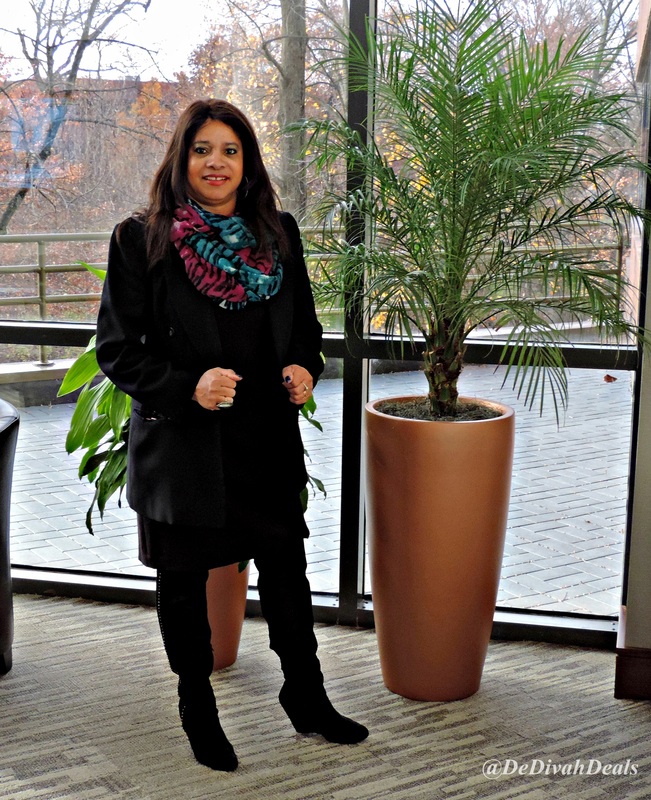 Last week, the weather in Delaware was still cool and crisp, it was more Fall like than Spring, but that didn’t stop me from shedding the pantyhose…now I need a serious tan! 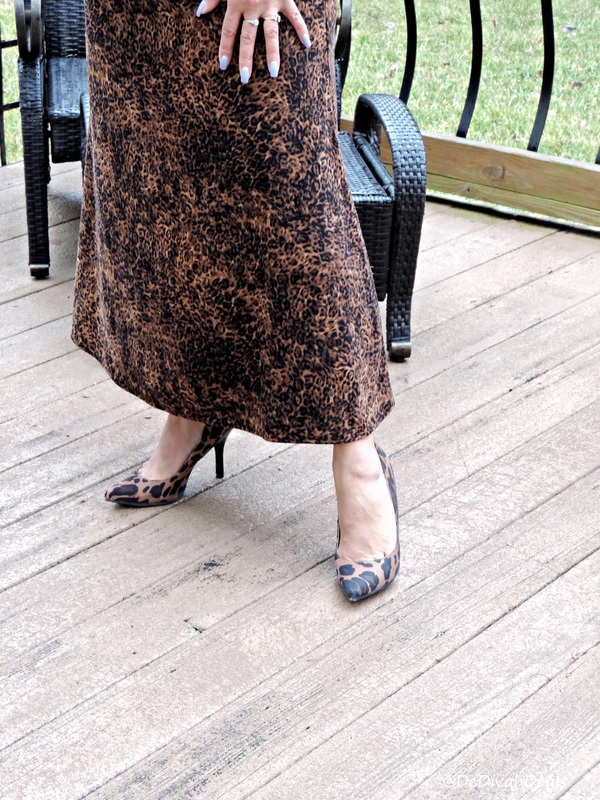 I may not have worn pantyhose, but I still needed to cover my legs which is why I chose to wear this Cheetah print maxi skirt. 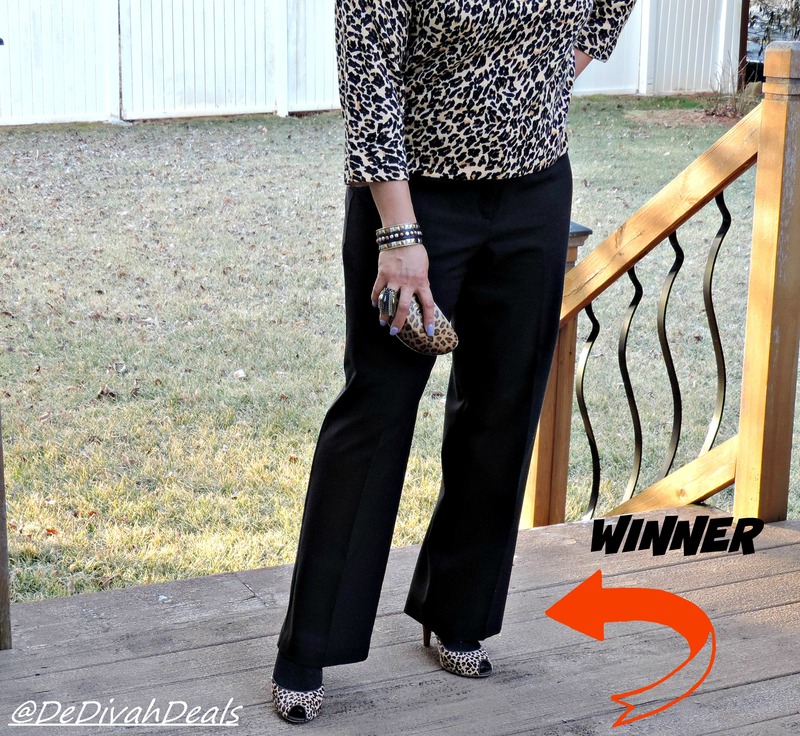 Yes, it’s thrifted from Goodwill and yes, I know that I wore a Cheetah print sweater last week…hey, what can I say…I love Cheetah…just wait until you see the other pair of shoes! If you remember these shoes, they are the Chinese Laundry suede pumps from DSW, the ones with a little tie in the back. Okay, so which pair do you choose? THANK YOU ALL FOR VOTING LAST WEEK, THE HEELS TOOK IT BY A LANDSLIDE! Hello friends, I trust you all had a wonderful week and perhaps are now gearing up for the best holiday of the season – THANKSGIVING! Anywho, I finally broke out the winter boots and have worn my favorite pair twice last week, the over-the-knee suede boots and I am lovin’ them. 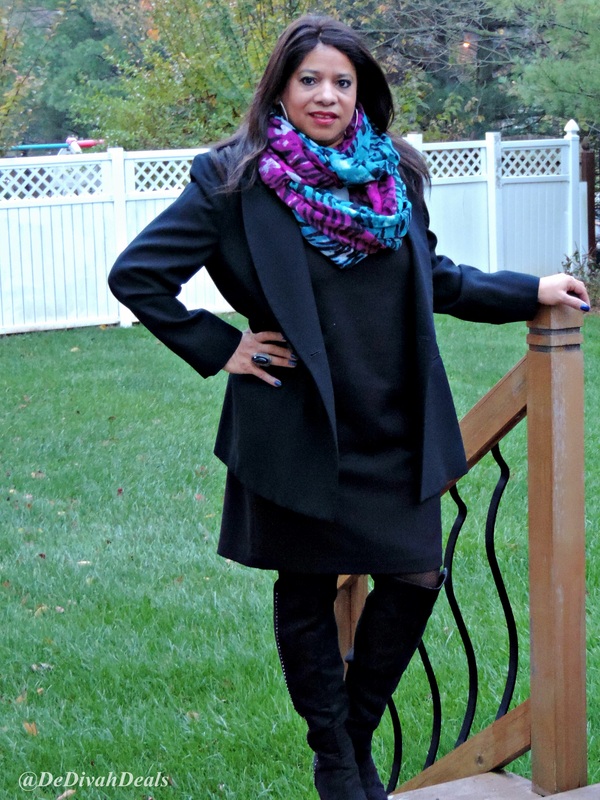 Today’s Sunday Style Roundup is featuring only two outfits and they are both entitled “Black N Boots” I also wore one of my Infinity Scarves purchased from Burlington Coat Factory to break up all the black in this outfit. 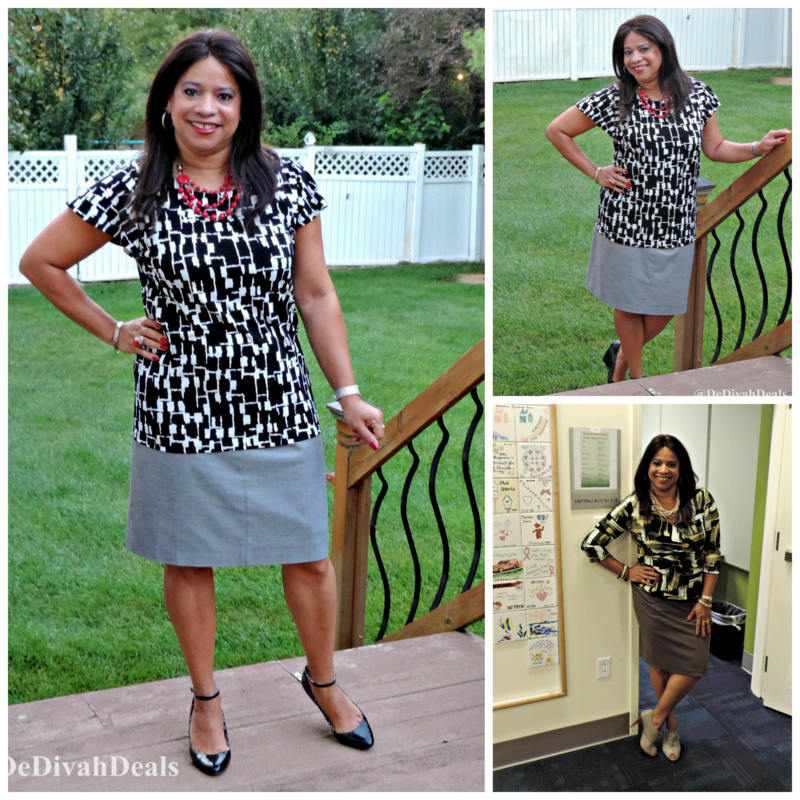 The dress is a sleeveless sheath from Ross and the blazer is thrifted from Goodwill. I always feel so corporate in a blazer and Goodwill is definitely the place to go for them. 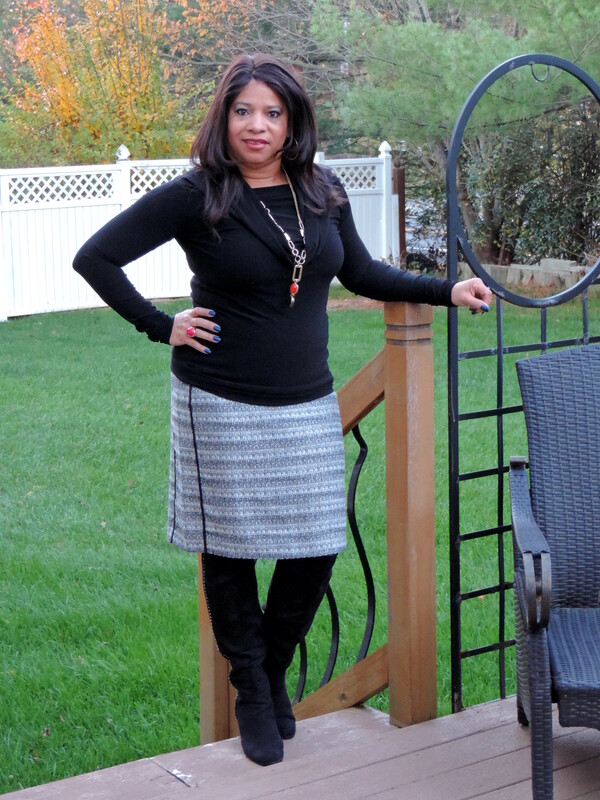 In this second outfit the skirt is Worthington and cowl neck are both from JCPenney. The necklace was a new piece thrifted from Goodwill. Today I am also featuring my oldest son, Tayair, not for what he’s wearing although he is handsome in his suit jacket. 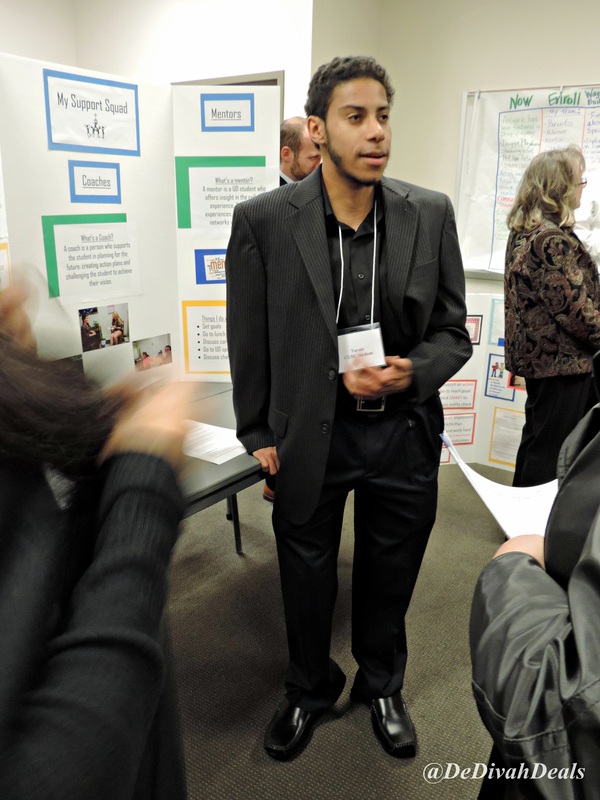 He spoke at his CLSC Open House on Tuesday evening. 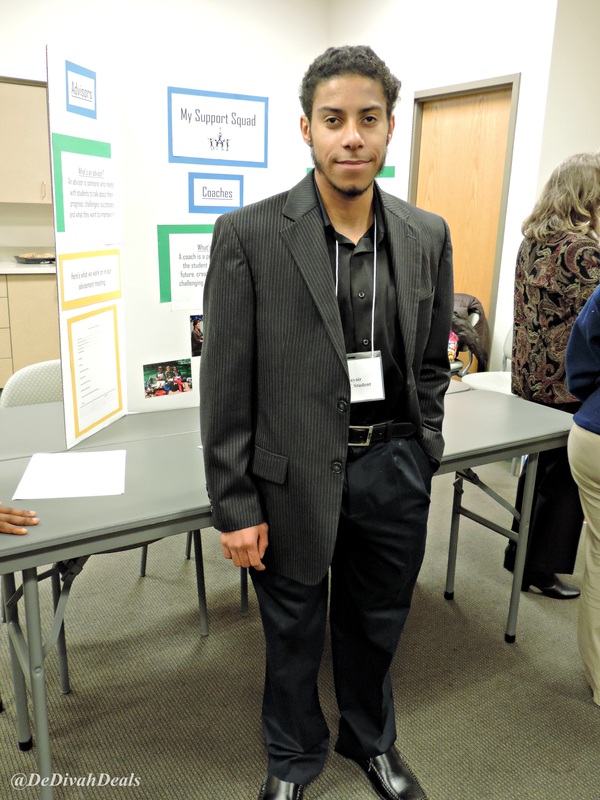 CLSC is the University of Delaware’s Career and Life Studies Certificate program, a 2-Year, non-residential college certificate program for young adults with intellectual disabilities and I was very proud of him! What do you think, have they started promoting Christmas too early?Enjoy the rest of the week! Hello friends and welcome to another episode of Stylin Sunday Roundup! It’s funny because I always think about a rodeo when I type the title of this post. The weather ’round here parts has been unpredictable which is evidenced by these three outfits. The temps have been up and down with damp and dry conditions in between and soon I’ll have to put on some tights. Stripes and Such is a mix of patterns with the leopard print booties that were purchased from the Deb Shop in the Exton Mall a few years back. 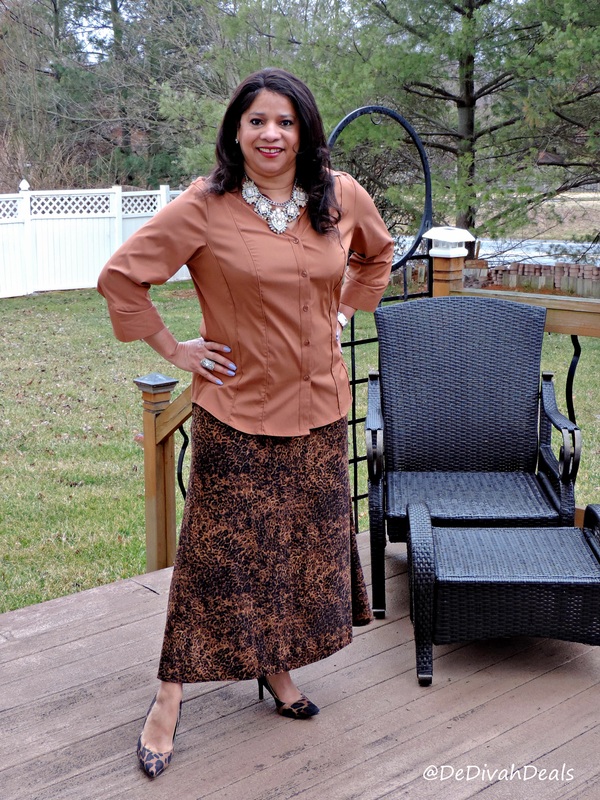 The grey skirt has black side panels so I chose this thrifted top as a complimentary accent. I do love my cardigan sweaters especially those that fall below my hips. This is my Polka Dot and Beads outfit. The sweater is a recent purchase from Burlington Coat Factory, the House of Dereon purse was also purchased from BCF but that was several years ago. My favorite “Betty Boop” polka dot shoes, beaded necklace and silver accessories completes the look. This last outfit is entitled “Goodwill Goodie” and not because of the outfit but because of the leather bag which I purchased for my son for $8.00. He wanted his father’s leather bag but we had donated it to Goodwill last year, so I was on the hunt for another one and this was perfect. I love thrifting at the Goodwill in Smyrna, DE. Speaking of Goodwill, I will once again be a Stylist for the 2015 Goodwill Runway Show and I am looking forward to working with the group again. 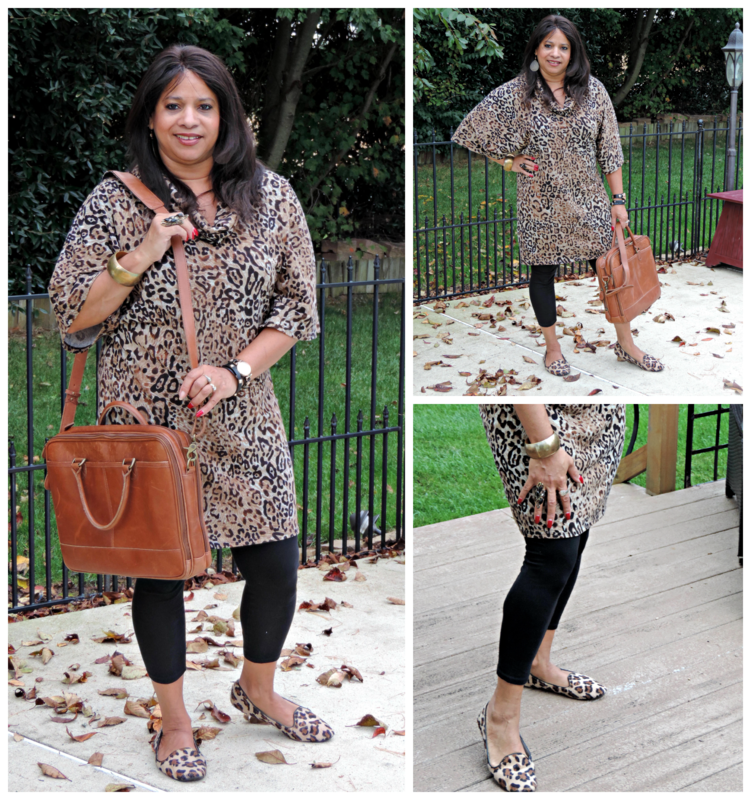 On this “no-work day casual Friday” I’m wearing leggings under a leopard print dress and leopard print flats from Citi Trends. You may remember that I wore this same outfit 2 years ago on Thanksgiving, it’s one of my casual favs. Brass earrings and bangle with a black band watch from Avon completes the look. So which outfit did you like best? I hope you had a wonderful weekend and will also have a fantabulous week ahead. Hello friends, I trust you all had a wonderful weekend, mine was quite busy and it’s going to continue late into the night. This evening I will be heading up to Wilmington to cover the Gordesi Launch Experience – Summer 2015 Collection as part of the VIP Press corp. I am really looking forward to attending this fashion event and I can’t wait to bring you all the exciting coverage. Speaking of fashion, here is last week’s outfit roundup. I am going to title this outfit “All in the Family”. Reading through fashion blogs I learned that if you are going to mix patterns, make sure the colors are all in the same family. 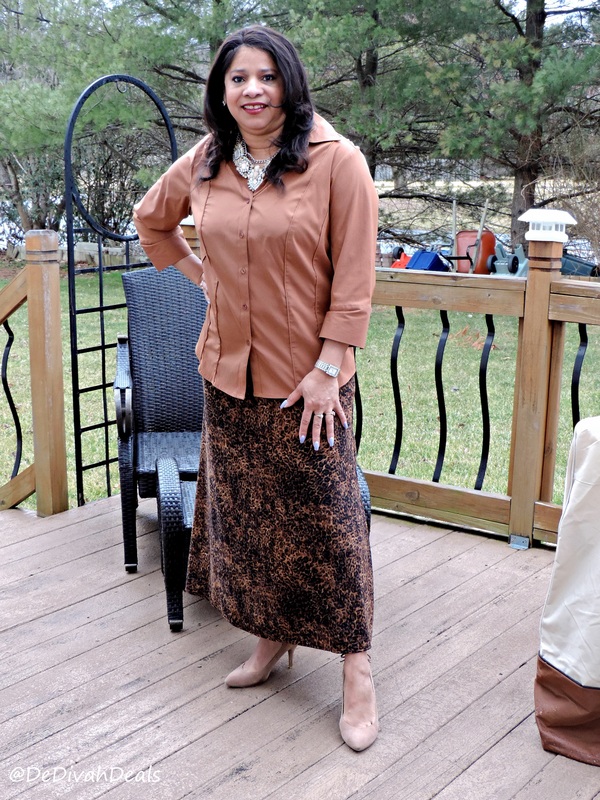 So with this maxi skirt and black and white shirt, I chose to wear leopard print shoes and purse, I surprised myself with how it all came together. The belt, purse and top were all thrifted from Goodwill, the flats were purchased at Citi Trends and the skirt has been in my closet forever. What do you think? This outfit I am calling “Black and Blue Block”. 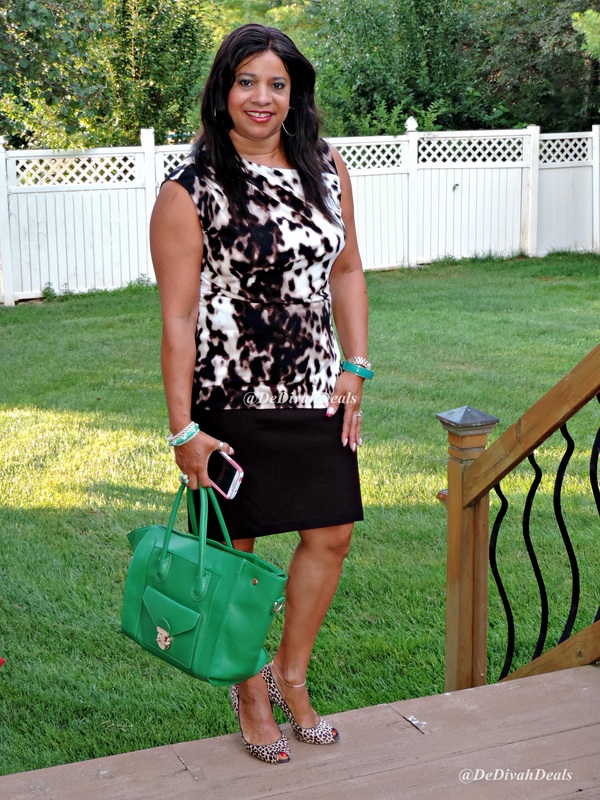 You know how much I like my sleeveless sheath dresses and this one from Ross is no exception, and with it are my favorite Mia heels and Buddah Bag. Necklace is Avon and bracelet is Old Navy. I’ve said it before and I’ll say it again, the best thing about a sheath dress is that you can wear it all year long by just adding a blazer or cardigan when the temperatures dip. Speaking of Avon, check out my latest YouTube Video, it’s an Avon unboxing which includes beauty supplies that will be part of my Holiday Spa Day Giveaway coming next month! Here I am in a bright Autumn orange. 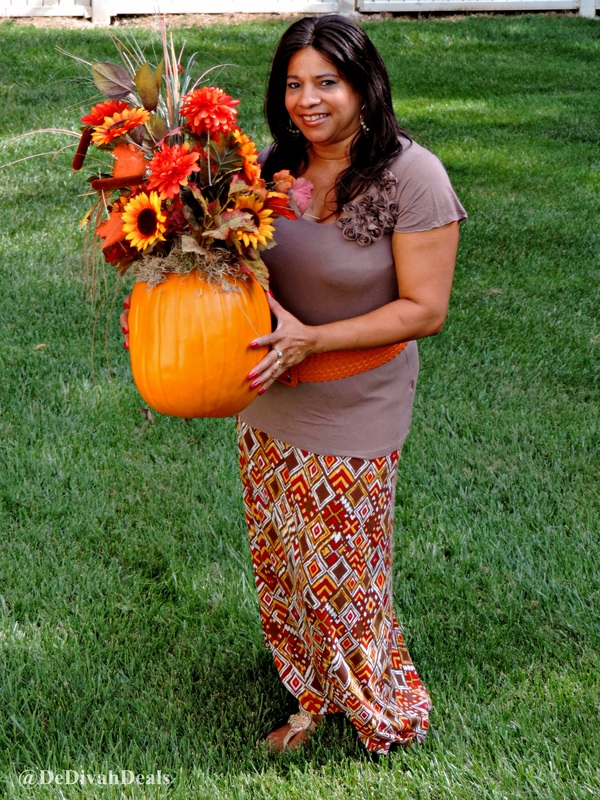 Orange is definitely a color that works well with my skin tone, not only in the summer but also during the fall. I like this top because it is so colorful and I think it was purchased at Rugged Wearhouse, can’t remember, but the wedge heels were. I love to mix and match my bangle bracelets as well as the multi color necklace. This Pumpkin floral arrangement was a free find at work, it almost got tossed in the trash but it’s the only thing I use to decorate the house because I donated all the other Halloween decorations a few years ago. Now that my sons are older, we don’t really celebrate it anymore. Do you decorate the house and yard for Halloween? This last outfit is entitled “Wild Wednesday”. Unfortunately, hubby didn’t get a good view of the peep toe wedges as they also have the “wild stripes” along the bottom. This purse has been in my closet since 2008, it was one of those “I have to go back and get it” finds at a Flea Market in Orlando. Unfortunately, it has been on the top shelf in my closet for years but I just won’t get rid of it. I love the Egyptian pattern but it’s too small to even hold my wallet! 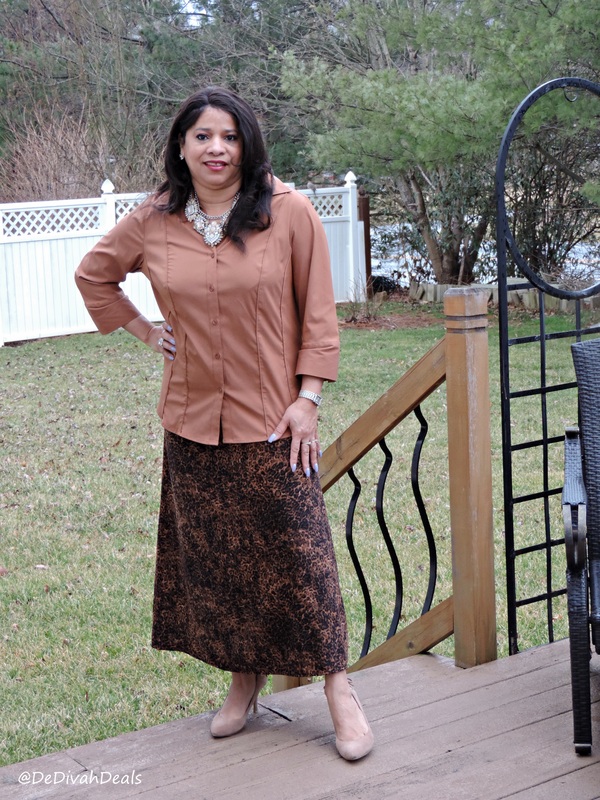 This khaki skirt was thrifted and the top is a one-piece twin set. In keeping with the wild theme, I am wearing brass earrings, beaded necklace, multi metal bracelet and oversized handmade ring – it was a wild and crazy day! So which outfit did you like the best? Enjoy the rest of your day and we’ll chat tomorrow at Money Monday. Hello friends and welcome to another week of Sunday Stylin Roundup. The last two weeks of summer were fantastic in Delaware, as a matter of fact the entire summer season was fantastic and Autumn is starting out just as nice. The four outfits being featured this week include a lot of black, but who doesn’t have a lot of black in their closets? 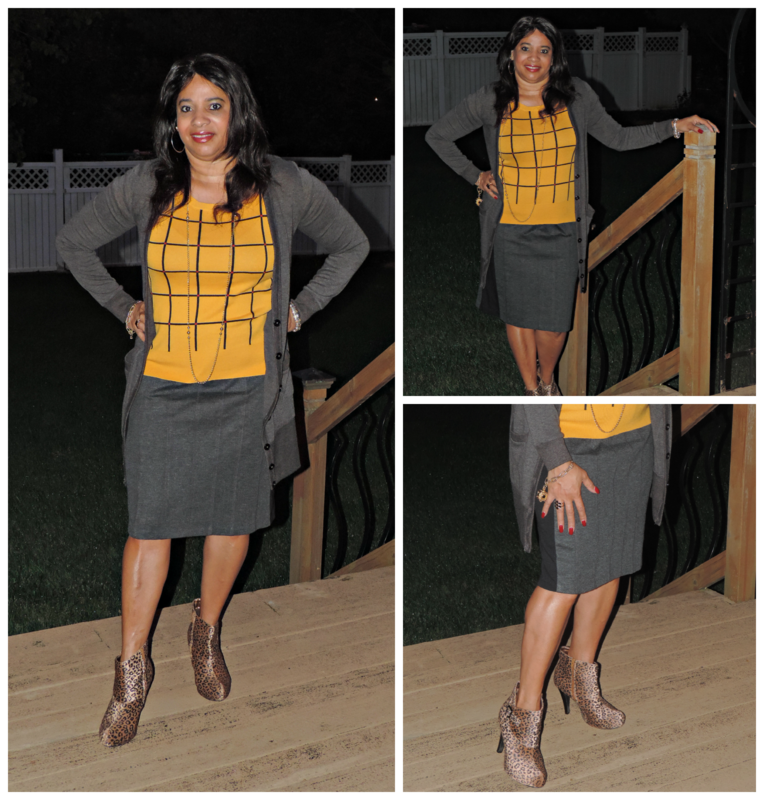 In this outfit there is a mix of black, beige and steel grey. The skirt is JCPenney, tank and shoes are thrifted and purse is from Burlington Coat Factory. The choker has been in my jewelry box for a long time, as a matter of fact, I believe it once belonged to my grandmother. I hadn’t done much shopping during the summer, however, this dress was one that I did buy at Ross. 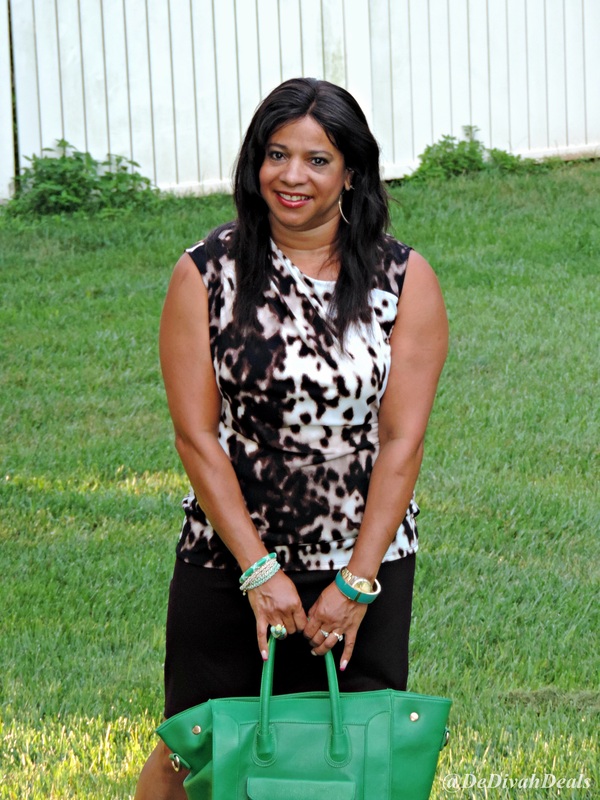 The Buddha Bag was purchased last year during Shop Small Business Saturday, and the Mia heels are from The Shoe Dept in the Exton Mall. The necklace was a Flea market find and the bracelet was $1.25 from Burlington Coat Factory. 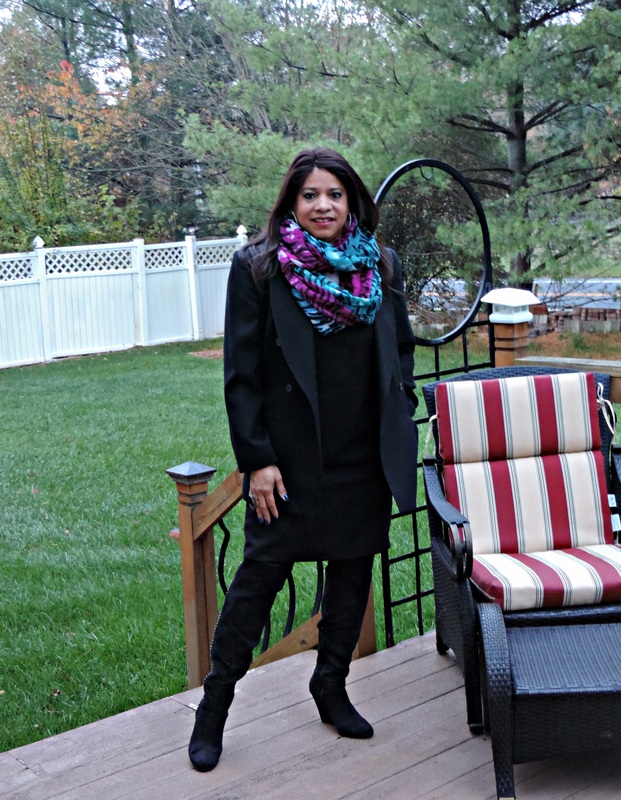 Leaves falling on the pool deck made for a perfect backdrop for this Blue by the Pool outfit. 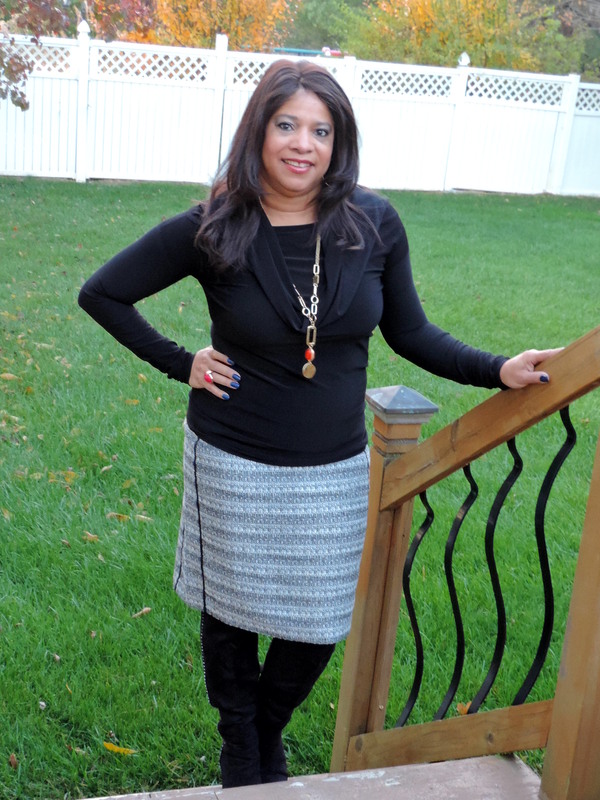 This is another skirt from JCPenney, top from Marshall’s and I won the necklace from a fellow blogger. The thrifted beige pumps and bracelet from Old Navy completes the look. I love turquoise blue – how about you? In the last outfit you can tell that the temperatures are beginning to change as did my wardrobe. 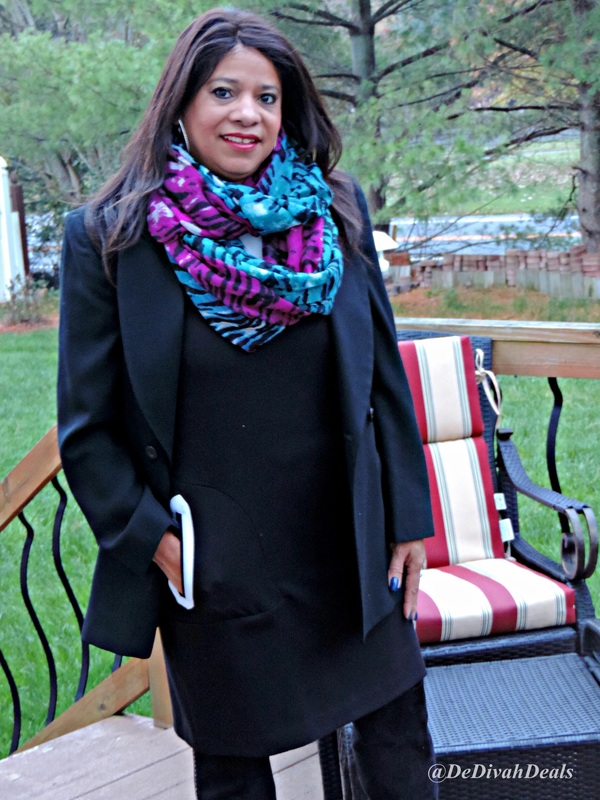 I will be wearing more long sleeves, blazers and cardigans so I spent more than 6 hours last Saturday in my closet, check out these before and after pics. I am not ready to cover my tootsies or wear tights, so I will continue wearing peep-toe shoes until the first snow fall. Which outfit did you like the best? Hello friends, each week I will put together a collage of my favorite outfits of the week, then post them here on Sunday Stylin RoundUp. 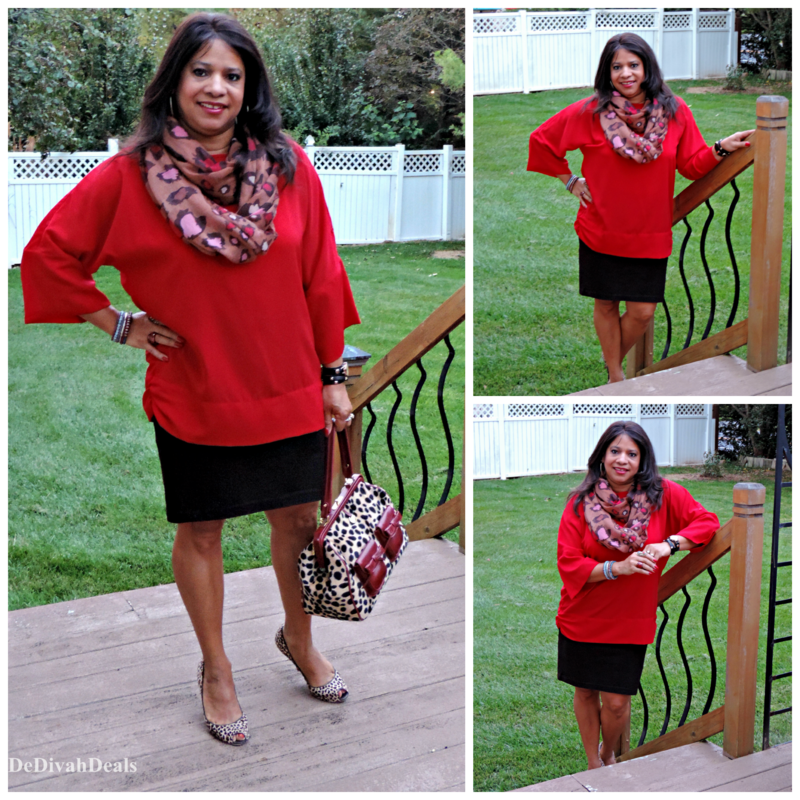 This first outfit I wore to the SITSGirls Bloggy Boot Camp in Philly. 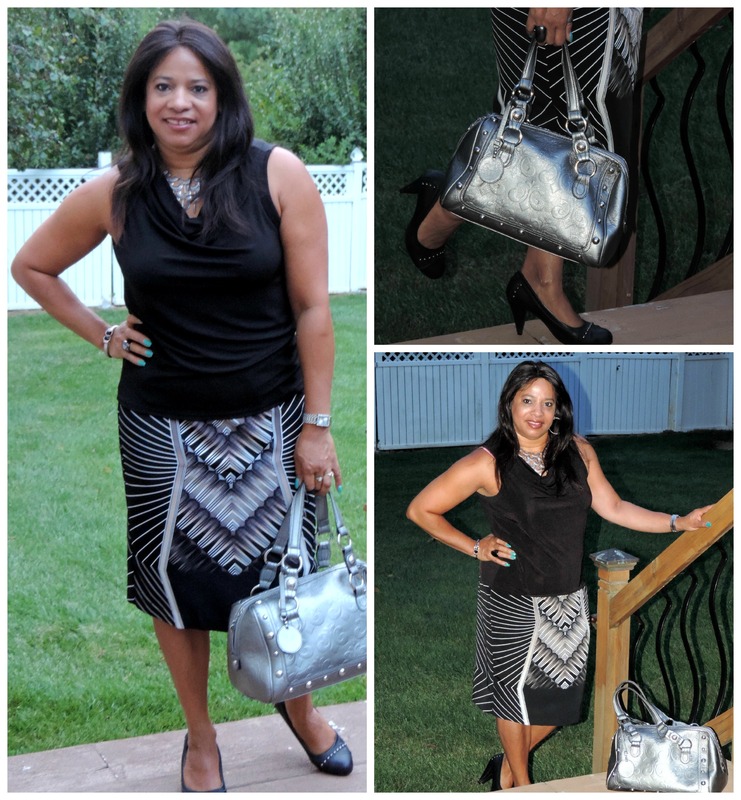 The skirt was a recent purchase from Burlington Coat Factory, as was the tote from Walmart. This tote bag was only $14.97 and they have a large selection in various colors, I will probably pick up another one in Cognac. The sandals and top are closet staples. The necklace and arm band are too old for me to remember where they were purchased but the red bracelet is from Old Navy. As you can see, I love the tote and wore it again to work the following Monday with a thrifted faux wrap dress from Goodwill and thrifted beige pumps. Necklace from Rugged Wearhouse, bracelet and ring both from Old Navy. 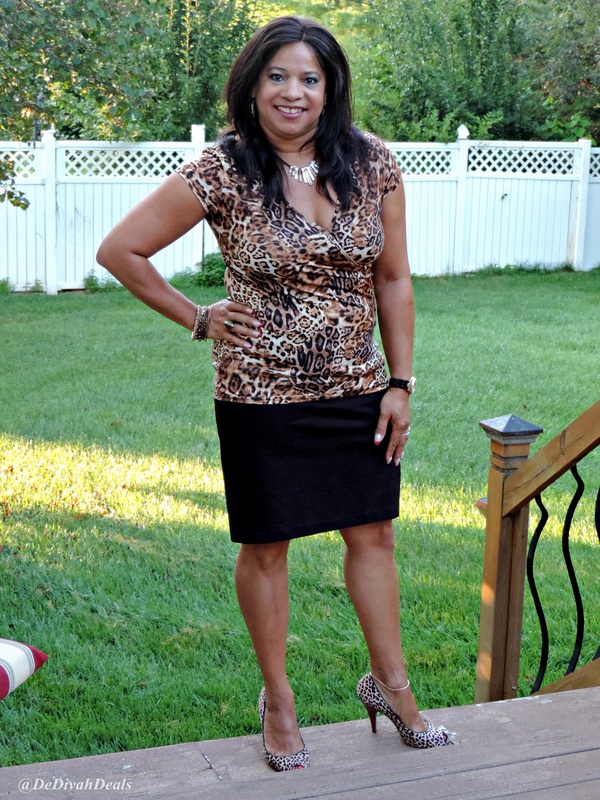 On Sunday, I wore another totally thrifted outfit, dress and purse, however the blue pumps and necklace are from Avon. Ring and bracelet are from Old Navy, as you can see I picked up several, but for $1.99 each wouldn’t you? 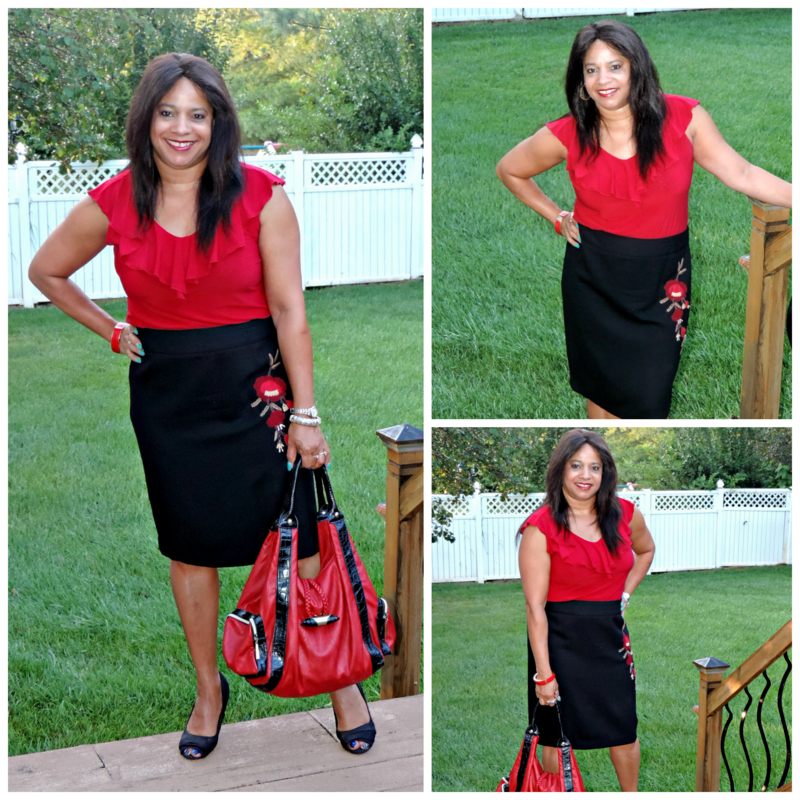 If you haven’t noticed by now, black and red is one of my favorite color combinations, and this outfit is definitely one of my summer favs. I wear this thrifted skirt all year long, so you will probably see this entire outfit again with a blazer. These were my favorite outfits from the first week in September, which one do you like the best? I trust you are all getting back into the swing of things after the long Labor Day weekend – just think tomorrow is Fri-Yay! 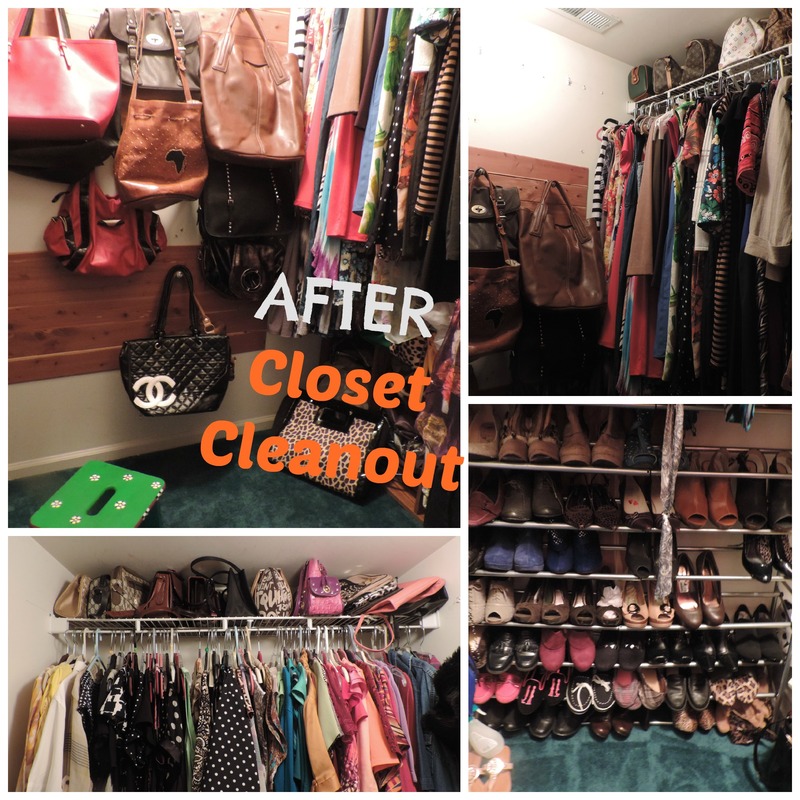 I spent most of my weekend clearing out the basement and was able to gather a lot of items to be donated to Goodwill. 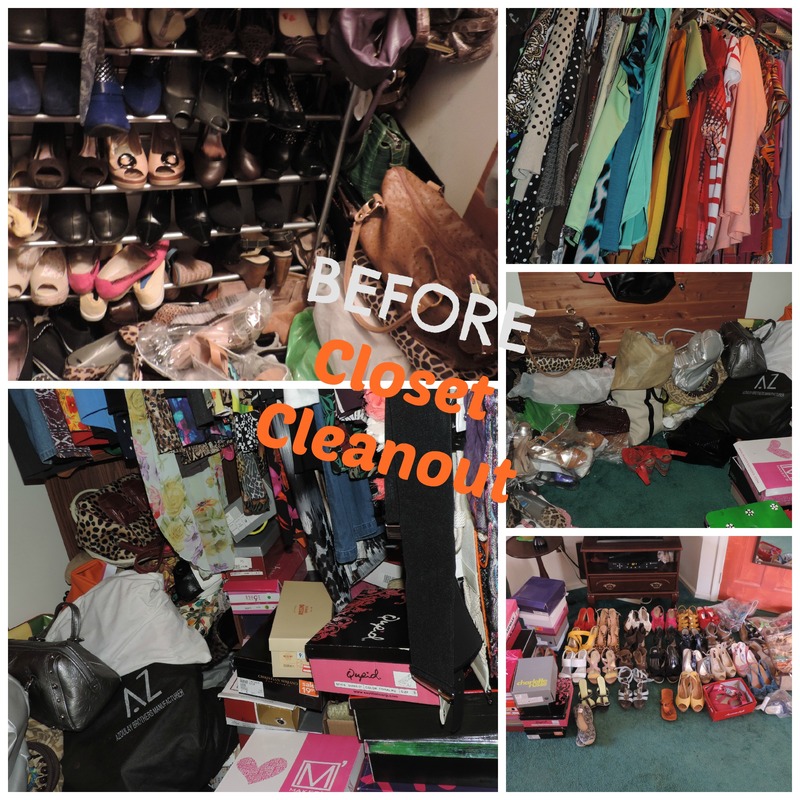 I am thankful to be blessed with an abundance, however, sometimes it can be a bit too much so donating the excess is always a good thing – Donate Stuff Create Jobs. Speaking of creating room in my closet, these two outfits were put together with the same skirt. 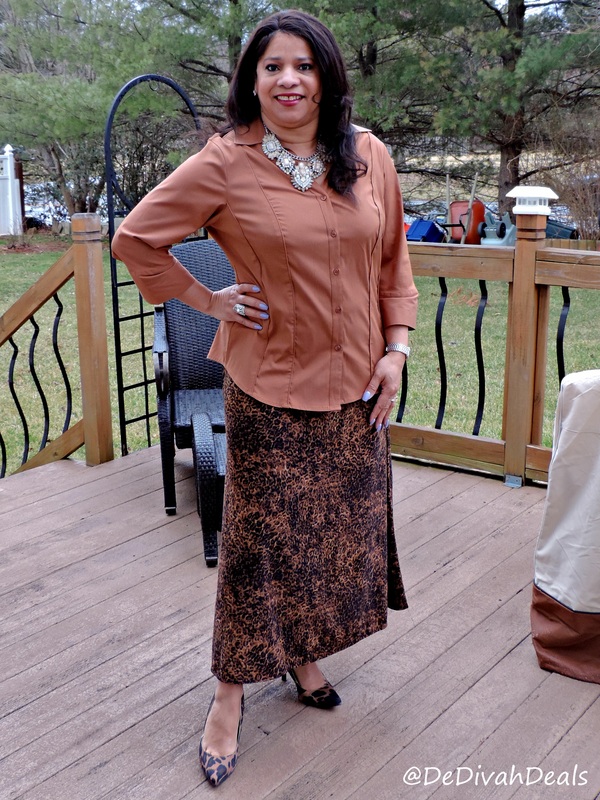 The skirt is a thrifted find from Goodwill and because brown is a great color for summer as well as fall you will probably see it again next month. The top was on clearance at J.C. Penney and the purse was also a great find however, not from Goodwill but from Ross. My accessories, the bracelets on the left and watch are from Avon, the bracelet on the right and ring are from Old Navy. 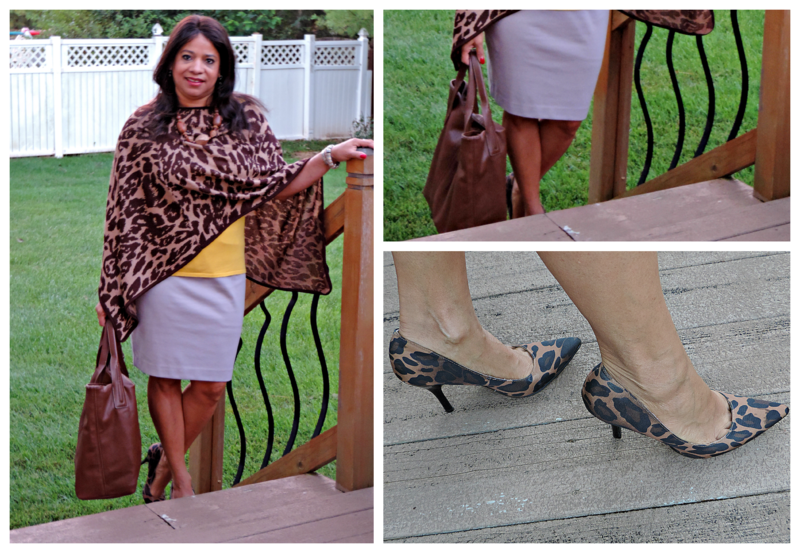 With each outfit I wore my favorite Jessica Simpson peep-toe pumps from Charmingly Linda’s Consignment Shop. I am so thankful that the weather was perfect during the summer months after such a harsh winter. Let’s pray for a gorgeous Indian Summer and Autumn. Even though I didn’t get a chance to wear a lot of my summer clothes, as I go through my closets, anything not worn in the past two years will be donated. 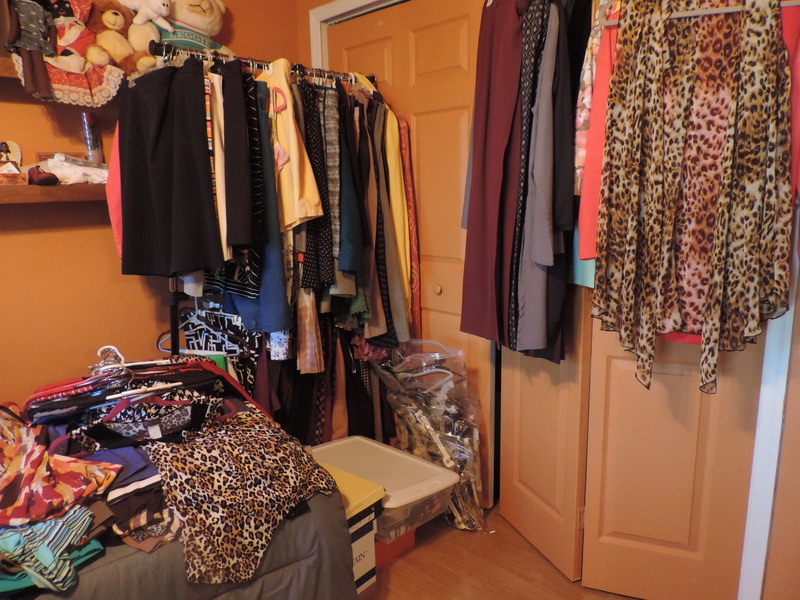 How do you decide when to get rid of clothing? 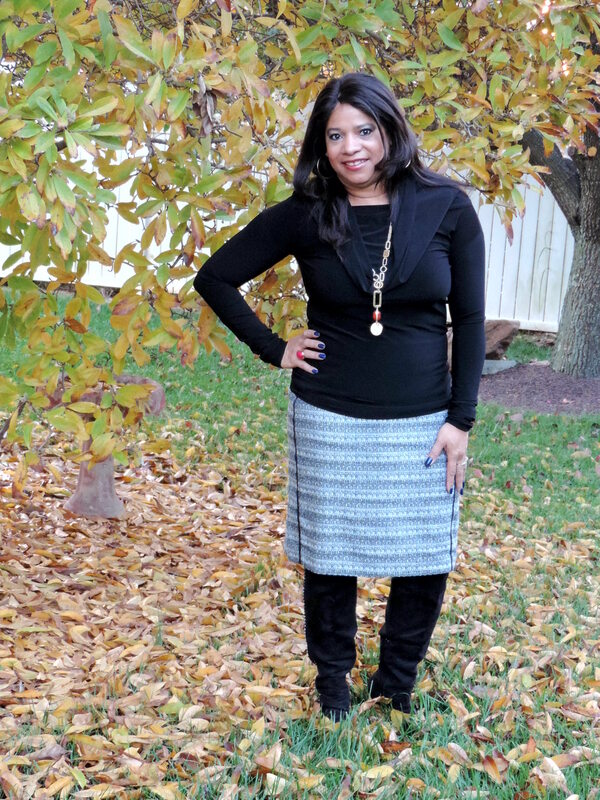 I am thankful that I am able to donate to Goodwill; I am thankful that we had a wonderful holiday; I am thankful to be attending my 1st SITS Bloggy Boot Camp in Philadelphia tomorrow and last but not least, I am thankful for my family, my friends and of course my faith.